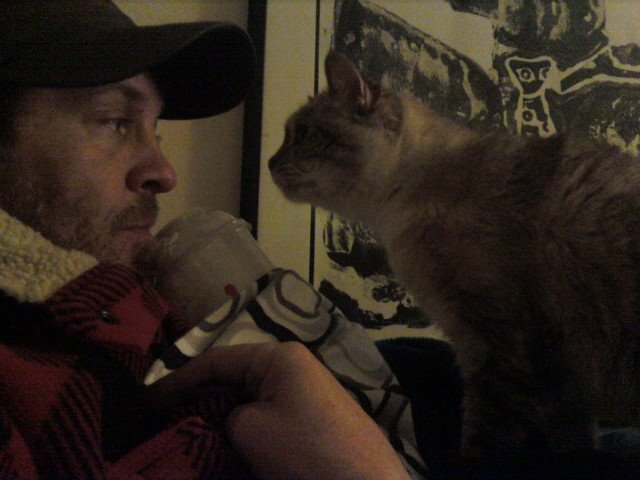 It’s now been a little more than 24 hours since my boyfriend and I made the decision to put down our cat, Donatella. She was diagnosed with cancer about two weeks ago, and just had her first chemo treatment last Friday, but her quality of life had deteriorated so much within the past week, we both made the decision to let her go – and not be in pain anymore. 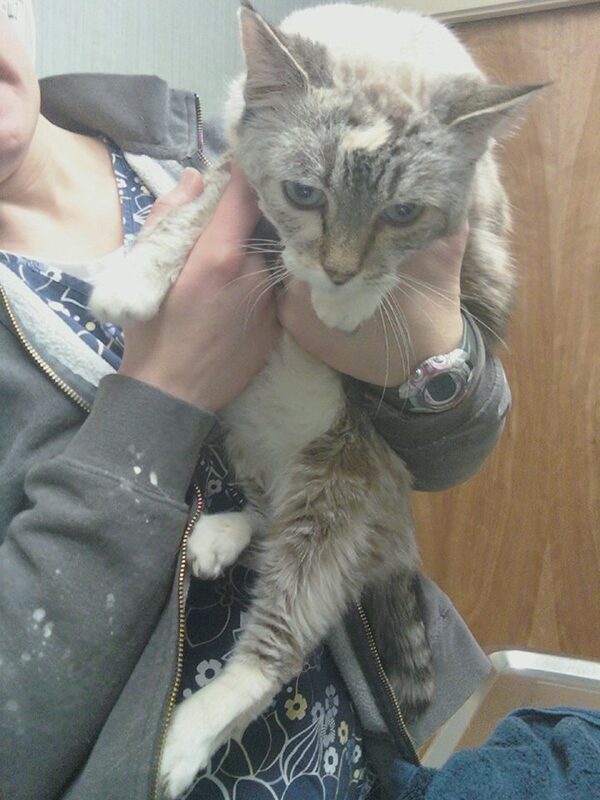 Our vet yesterday agreed with our decision, and allowed us to say goodbye to her one last time. The last few days had been torture watching her. Literally a month ago, she was full of life and playful, crying for food, and following us around our apartment. She was about 8. And we both made the decision that we didn’t want to prolong her life, we just didn’t want her to be in pain, so if chemo worked for her, awesome. But I think her diagnosis was too late – she was frail and could barely walk. Her spleen somehow became enlarged so it was assumed she had lymphoma or leukemia. But the vet didn’t want to hurt her spleen unnecessarily, so treatment was the next step, and luckily, both cancers are treated the same way. I followed him to the hallway where I saw our two other cats staring in confusion at me from my bedroom doorway. I kept hearing “meow, meow, meow….” He opened the door to a small and frightened light brown and white cat sitting on a towel with a food and water bowl next to it. “Awwwww hi.” My heart instantly melted. For the next two days, it hid, and then I felt it move under the bed one night. Found it! 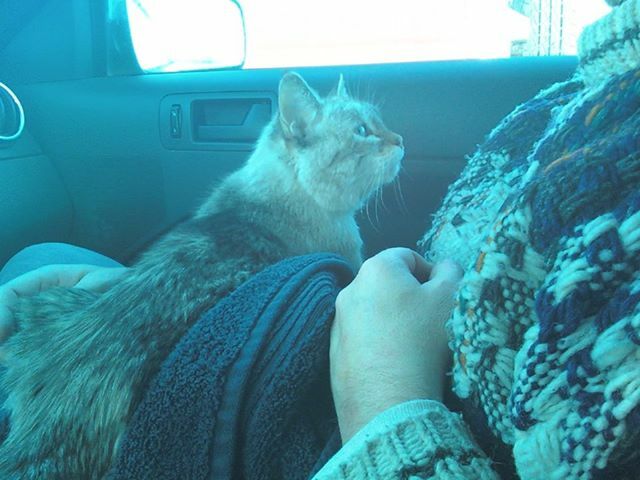 We took it to the vet for treatment where we found out it was a girl! “Of course I am you idiot!” she shot back with a disgusted look. The next few days she was fed in our bedroom separately from the two other kitties and was slowly integrated into their lives. And then she turned into a diva! A few people at work suggested the name Donatella to me, so we named her that. It was very fitting! At some point she learned that when my alarm went off in the morning, that meant I’d get up, so she learned she could get food at the same time! I can’t tell you how many times she’d be literally in my face whhhaaaaaaaying away waiting for me! And if I wasn’t fast enough, she lay down next to me and wait. No, she didn’t meow like other cats, she’d whhhhaaaaaay. And in a small, sometimes quiet voice. You’d have to lean in to hear her. I’m sure my mother was ecstatic yesterday when she saw Donatella enter heaven! Lord, I can only imagine her taking Donatella everywhere showing *my cat off to *her new friends! You’re welcome mom! I was just happy we could love her and feed her and give her a warm home. She was spade, so I assume someone loved her before. But when my boyfriend saw her, she was drooling, her fur was matted, her backbone was visible and she had a chipped tooth. She’d become a garbage kitty to survive, which still breaks my heart to think about. But she lived up to that persona to her last day. She loved getting in our kitchen garbage and opening cupboards. I finally gave in and got babylocks! No food would go unexamined. She especially loved milkshakes! Want proof? She loved playing with chopsticks and beer bottle caps. Her adopted brothers had passed on a giant hemp rope fish, so when she came along I showed it to her and said she could play with it. Within 3 years, it was stripped bare of rope, so I stole it to my dad’s house for “repair” (new rope.) It didn’t get fixed in time. Which was fine; she couldn’t stand up for more than a few minutes at a time by that point. She’d get up, fall against the door/wall and lay back down in the bathroom. On her last day, I got up, picked out my clothes and put them on the floor in the bathroom. She cried, got up, walked on top of the clothes, and then peed on them. I got mad, and moved her, but it was too late. I walked out, grumbled to my boyfriend and got new clothes, and put the others, including the only pair of Levi’s I have in the washer. He let me wear a pair of his button-down Levi’s. He then got up, went to her and started to cry. He knew. He lovingly placed her in a bath towel in his arms and held her all the way to the vet’s office. It was very sweet to see how much love he showed her, and showed me at the same time. We made sure to give her lots of pets and kisses. 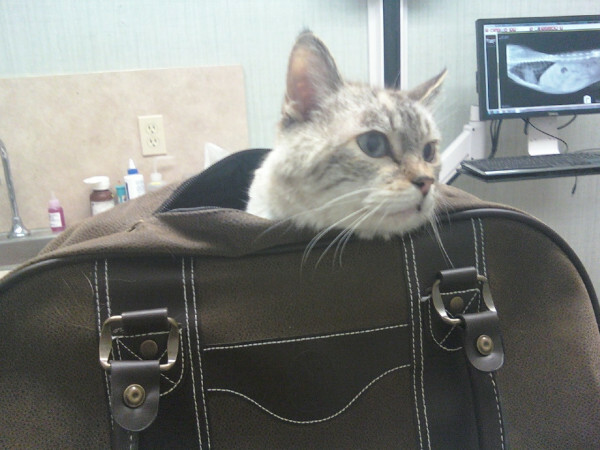 I took one last photo at the vet’s office. I should be getting a call at any moment to pick up her ashes. She will be placed next to her two other adopted brothers, Plop and Sushi in the windowsill. The day after her death I made a $100 donation to the Nevada Humane Society in her name. I wanted Donatella to live on, letting other kitties have the same opportunity she did. All animals deserve love. 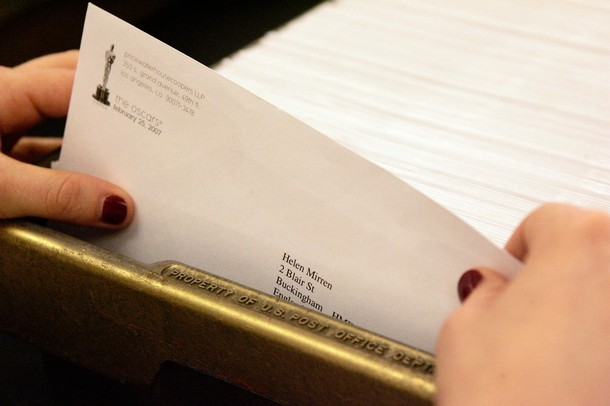 Oscar voters, start your ballots. 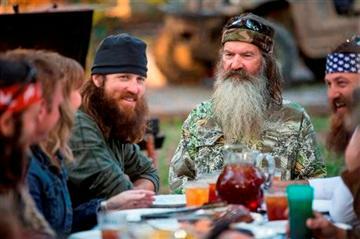 The A&E channel said it’s reversing its decision to drop “Duck Dynasty” patriarch Phil Robertson from the show for his remarks about gays. The channel had put Robertson on what it called “hiatus” following his comments in a magazine article about how the Bible informs his view of gays. His comments were slammed by groups including GLAAD, the gay media watch organization. But A&E’s decision drew a backlash from those who said they supported Robertson’s comments and others who defended him on the basis of freedom of speech. Universal Pictures has delayed the release of “Fast & Furious 7” for almost a year following the death of star Paul Walker. 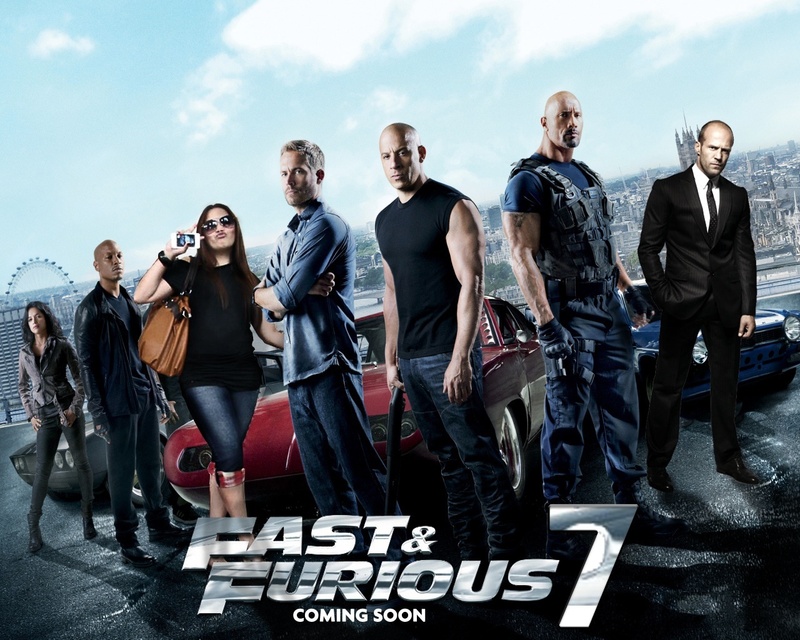 The studio announced Monday that the “Fast & Furious” sequel will be released on April 10, 2015, instead of July. Shooting on the film was about halfway finished when the 40-year-old Walker died in a car crash outside of Los Angeles. Nirvana, Kiss and Peter Gabriel will be inducted into the Rock and Roll Hall of Fame next year. The Rock Hall announced Tuesday that Hall and Oates, Linda Ronstadt and Cat Stevens will also be inducted April 10 at the Barclays Center in Brooklyn. Among the first-time nominees are Hall and Oates, Gabriel, Ronstadt and Nirvana, nominated in its first year of eligibility. Repeat nominees Kiss and Stevens make the cut after being absent from the list for several years. The Rolling Stones managers, Andrew Loog Oldham and Brian Epstein, will earn the Ahmet Ertegun award, a non-performing honor. Bruce Springsteen’s E Street Band will earn the award for musical excellence. The 29th annual induction ceremony will be open to the public. Tickets go on sale next month. He has denounced the world’s “idolatry of money” and the “global scandal” that nearly 1 billion people today go hungry, and has charmed the masses with his simple style and wry sense of humor. His appearances draw tens of thousands of people at a clip and his @Pontifex Twitter account recently topped 10 million followers. 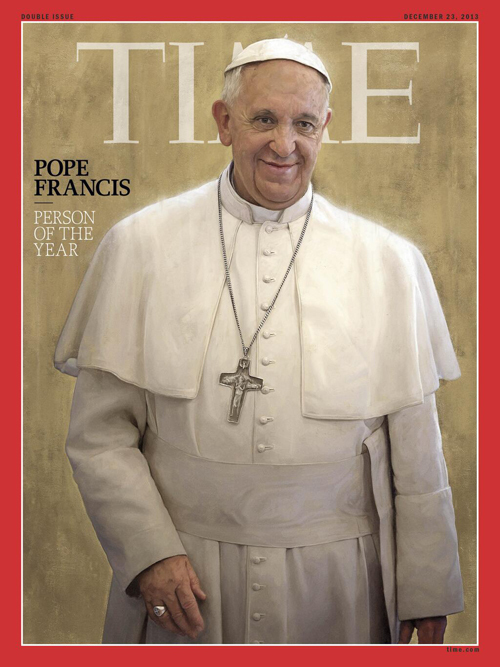 Time editors made the selection. The magazine polled readers for their choice, and the winner was Egyptian General Abdel-Fattah el-Sissi, who didn’t even make the top 10 of Time’s final list. 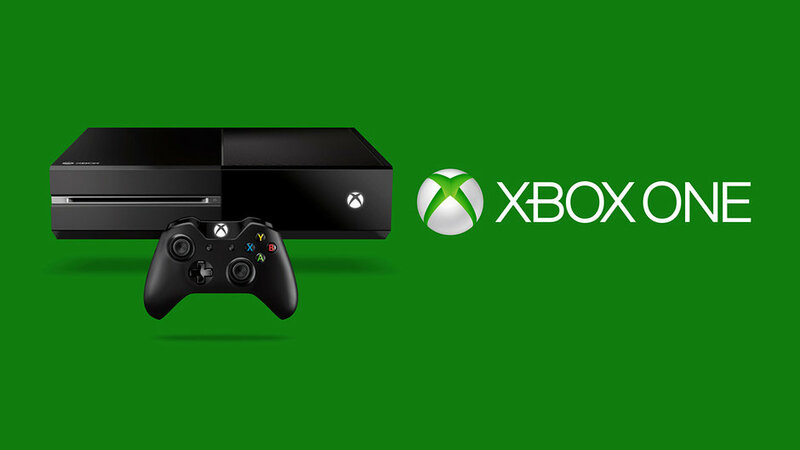 Microsoft says more than 2 million of its Xbox One consoles have been sold since the system’s launch 18 days ago. That works out to an average of 111,111 units per day. And company officials say users have spent over 83 million hours with the games, TV, and apps on Xbox One since the Nov. 22 launch. Yusuf Mehdi, corporate vice president of strategy and marketing for Xbox, says demand is exceeding supply in the 13 launch markets, with Xbox One sold out at most retailers.